In every herd there is a lead mare and a lead stallion (well, in our case a lead gelding). Tareena is our lead mare and owns this position with a presence of grace, wisdom, and strength. Her medicine is one of intuition, of leading with the strength of the feminine, and of knowing how to hold ourselves in the balance of softness and fierceness. We often call her the unicorn in disguise as she also reminds us that within each of us, we carry a magic that is larger than the physical self. We added Chief to our herd when we moved to our new ranch. A previous trail horse, Chief quietly but solidly, made his way to the lead position of our herd within three weeks of our arrival. He is a strong and present leader that demands we enter into the space of trust with him. He is solid and he is dependable, earn his trust and you will have his loyalty for life. Indra was the first horse to join us. Adopted from a rescue at age 3, he has been one of our biggest teachers in the way of the horse. Indra is a protector and defender of sacred space. He is deeply wise and rooted in the partnership we hold with the horses, and reminds us of the mastery within each of us. Wild and explosive, Indra is a horse that will often display his power of the physical form in play and in teaching. He is the most balanced of our geldings and a horse that is deeply in tune with his wild and pure horse nature. He often takes on the role of supporting and empowering the lead gelding and protecting the lead mare. Martini joined our herd a week before we moved to our beautiful 80 acre ranch. He came to us from the same owners as Tareena. Reunited with his past herd mate, Martini quickly came into our herd and established himself as a new leader. Calm, cool, and collected, Martini has a presence of a gentleman. Solid in his boundaries, with calm and refined presence he brings an air of class into our herd. Rudy joined our herd originally as a board horse. We knew when we met him though that he was something special. He instantly showed an eagerness to be a part of our herd and the space we hold with people, and he quickly became a master at his new purpose as a teacher. A kind and gentle giant, Rudy is often the horse in the herd that people pick out as a leader because of his size, presence, and beauty. He is not the leader, however Rudy is the kindest horse in the herd, and that says a lot. He makes himself most present when one of his herd mates or a person is in need of emotional comfort and warmth. A true friend in every sense of the word, his heart is as big as his size. We are honored to have brought Rudy with us as an official member of our herd when we moved to our current new space. Our resident comedian, Cheveyo has quite the personality. Curious, bold, and unapologetic, he is a horse that will put himself in your space whether you would like him to do so or not - luckily however, his charm and his teaching allows him to get away with it. A teacher of boundaries and of showing up fully and completely in who we are, he is a horse that demands that we step into ourselves with full permission. You will often see Cheveyo with his good friend Rudy or enjoying his favorite pastimes of eating and sleeping. He joined our herd after capturing our hearts from the first time we met him and we have enjoyed his light and audacious teaching ever since. Shiva joined us in May of 2015, a week after we lost our lead gelding at the time, Abe. Shiva's presence, out of all the horses we have integrated into the herd, really shook up the dynamics. He came to us after having an 11 year career as a show horse, and without the experience of living amongst a big herd. Shiva demands complete power and presence without caution. He is a horse that helps us move through our places of fear into the fullness of our power. He, out of all of our horses, will push someone to their edges, forcing them to really and truly look their fullness in the face - and the transformation on the other side of that is profound. He holds no mercy and in that strength forces us to see the full power and force of our own leadership. Athena is our resident Diva, who joined us after an illustrious career in dressage and a mount for the disabled. At 27 years old she is one of our senior residents and still holds her youthful demeanor and form despite her age. Athena is one of our four mares and her medicine and strength is one of authenticity. In order to have her spend time in your presence you must meet her in that space of authentic connection. She demands nothing less. She is unequivocally patient with us as we find our way to knowing our true power and shows us what it looks like to step forward in the most powerful parts of who we are. Jet is one of the four trail horses we welcomed into our herd when we moved to the ranch. From the moment I met Jet he stood out to me. I truly feel that he chose to join us, to become a part of the space we hold in the horse/human partnering. Jet is a horse that wants to get as close as he can to you - he actually seems to often prefer the presence of people than he does his own herd mates and will always let you know how he feels about being in your space. Jet is a perfect name for this horse as he has speed within him. He knows the power of his stride and invites us to explore and see the heights in which we are destined to rise to in our lives. Jack is a 23 year old quarter horse gelding another one of the four that we welcomed when we moved to the ranch. He has a softness and a gentleness about him, and is a horse that has always put his purpose before himself. Jack represents a new dawn and an expectation that no matter what pain or trauma of the past lingers, we can open ourselves up to new beginnings with a knowing that it will be positive and where we and the circumstances have shifted. Jack ask us to trust ourselves in navigating our new spaces and to welcome them knowing they are blessings to our lives. Indy was the youngest horse ever to join our herd at 7 months old, a wildie now 4 years old, she was born in a feral herd in interior british columbia and saved from going to slaughter. Indy or we like to call her Indiana Jones, will one day be lead mare, our wild child, she is adventurous, playful, confident, wise and holds that space of knowing her destiny but enjoying her journey until she is ready to fulfill it. She encourages us to see life as an adventure and be fearless in the pursuit of it. Aries came to us in the fall of 2016. An 11-year-old paint horse, he was looking for a retirement home after being bought from auction only to discover to be lame and unrideable. We happily took Aries in after meeting him due to his kind and solid nature. A nurturer, he is our holder of heart consciousness and being aware of our ability to tap into a wisdom that is greater than self. He is a gentle horse that holds a beautiful balance of compassion and strength. Peter Pan is one of our youngsters in the herd at 2 years old. He came to us through our local vet clinic. Bred to be a ranch horse, he was injured as a yearling which prevented him from being able to be ridden so he found himself a home at our ranch. We gave Peter Pan his name because of his mischievous yet wise wisdom he carries. He has an energy about him that reminds us to lighten up, to trust the magic and fate of life and to embrace the journey that we are on. He is a calm and light-hearted horse that is always eager to remind us to play and to find the wisdom in all places that occupy our lives. Aine is a 16-year-old thoroughbred mare that came to us needing a retirement home, she is an off the track thoroughbred that found her way from the racetrack to a life as a ranch horse and now to our herd of medicine horses. She is named after the Celtic goddess Aine, who represents summer, fertility and abundance who was often depicted as a red mare. Aine is a soft and understated presence in our herd, whose gentle yet profound messages always land deeply with those she shows up for. Happy holds the medicine of a wounded healer, a 6 year old appaloosa gelding he is the only horse in our herd that doesn’t not directly eblong to us he was rescued from the SPCA from a lovely woman who boards him at our ranch. Happy’s history is one that is wrought with trauma and neglect and yet this beautiful horse has emerged as a gentle and wise soul that often shows up when we are in need to move beyond our own wounding to be more deeply in our own medicine. Louie is a 28-year-old Appendix Quarter horse gelding that lives with our seniour herd Honey and Athena. Louie brings the medicine of an elder grandfather, steady and strong as an oak tree, when we stand next to him we can’t help but feel rooted more deeply in ourselves and to this earth. He is a gentle yet powerful soul that gives us the medicine of grounding through ancient wisdom. If we need to be reminded of our own ancient wisdom and feel the safety and comfort of being rooted Louie is the medicine to take us there. Kali is a 6-year-old thoroughbred Arabian cross that was rescued from a kill pen with foal at side 2 years ago. She found as she was once again looking for a place to save her from a fate that she was not yet ready for into a purpose of being a powerful medicine teacher in our herd. Kali was named after the Hindu goddess of death and rebirth, her own story mirrors this mares powerful energy that is both fierce and deeply loving. She is a strong and fiery mare that will often show up when we are in the process of rebirthing ourselves to a more authentic and aligned place where we remember our power and strength of who be in this world. Malachi is a 14-year-old Percheron Gelding that was rescued from the BC wildfires through the SPCA. This soft yet powerful horse brings us the medicine of the messenger a reminder that we have a divine purpose in life that we are meant to be carriers of. You can’t help but be touched by the enormity and magic of this horses presence when you meet him, some say they can see the wings and feel it as they receive the medicine he brings to the herd. His own journey to get here is quite the story, you can read more about that here. Ostara is a 19 year old mare we adopted from the SPCA where she had been taken to be saved from severe neglect. She is Apollo's mother. Ostara lived a life where she had minimal handling and care and she came to us in foal with Apollo. We named her Ostara after the German goddess of Easter because she arrived on Easter weekend. The medicine of this mare is about new beginnings, the birth of spring, which was all part of her transformation at the ranch. Still a bit feral, she has a soft energy, but powerful, that we have enjoyed watching emerge since she has come to our farm to begin her new life. Named after the Greek god who pulled the sun across the sky, we gave Apollo his name because we felt he represented the power of the sun, solar, enlightenment and purity. He carries no burden of his mother. He is powerful, strong and curious. His presence reminds us that we too have a purity within us, we are born untouched by the dramas of life and we can return back there. It is strength, it is light and it is a remembrance of who we are. Dharma is a 20 year old mare that came to us from a woman who was navigating through personal tragedy. Her name, which means ‘cosmic order’, is a representation of when we are ready to leap and live beyond the darkness of our past and honor that life is meant to be created through consciousness and bliss, and it can be transformed from one of struggle to one of lightness. Since joining our herd, we have watched Dharma become more solid in herself and embrace the medicine she brings to the world. Flicka is a 27 year old Arabian mare that came to us through our a wonderful woman that makes our equine jewelry. Flicka spent many years being a lone horse in a field with minimal interaction with people until a kind woman came into her life and then found us. Flicka came to join our senior herd in December of 2017 after we lost our senior mare, Honey. Flicka carries the medicine of unconditional acceptance and love no matter what path we find ourselves in life. She is a kind and sweet soul that loves sharing her medicine and spending time with those that are drawn to her soft and gentle energy. Prana belongs to our retreat manager. Prana means ‘life force energy’. 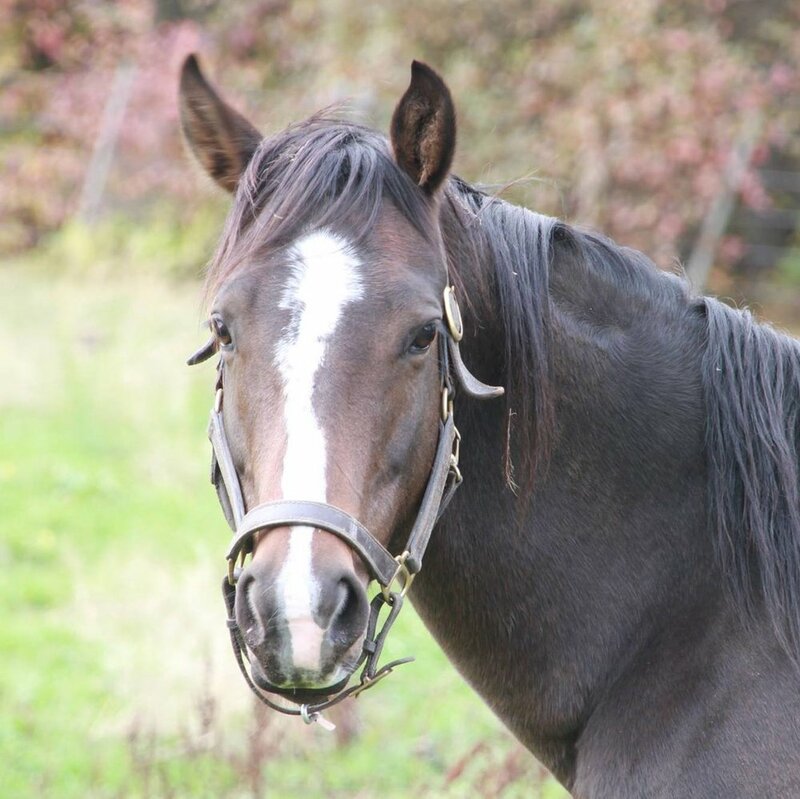 Prana is a very nurturing, balanced mare who has overcome hardship early in life. She is often quite vigilant, watching over the wellbeing of her herd-mates. As a yearling, Prana was rescued from a negligent owner who had starved her and her brother. Sadly, Prana’s brother did not survive. This mare holds no grudge over her past and reminds of us of the power of forgiveness. Prana’s message is also to just breathe, connect to our life force and live in balance with ourselves and the world around us. We consider Prana an example of divine feminine energy. Chiron is a sweet and sensitive, 7yr old gelding we consider a ‘super empath’ (very sensitive to energy). Chiron means ‘wounded healer’. Chiron was started with outdated methods of horsemanship that ignored and neglected his sensitive nature so he often exploded when he felt he wasn’t heard. He was re-started with natural horsemanship methods by a kind, new owner and was shown in hunter jumper, by a young girl he loved deeply. Sadly, he was sold to a new owner who did not understand his sensitive nature which caused him to be explosive so he was slated for euthanasia. Fortunately, Chiron found his way to Epona Rise through our manager. Chiron’s message is about understanding ourselves as empaths and how we are affected by energy; creating healthy boundaries and not sacrificing our authentic selves and our path even when pressured to do so. Chiron has healed his wounds and is now a powerful teacher of empathy. As part of bringing horses into our lives we also have the experience of losing them. We currently have four horses that are part of our spirit herd, who although have left us in their physical presence, are still deeply felt in their essence and spirit of our herd. Jake was the last of the four that we welcomed in the herd as a previous resident of the ranch. Jake was often seen on his own, enjoying hay and minding his own company. He had a calm and peaceful presence that easily brought people into a slowness and stillness of life. He was not worried about much, didn't get overly excited about what went on around him, and held the wisdom as one of the elders of the herd. A true companion, I imagine Jake to be the one that would welcome you to sit down, let go of your cares, and enjoy a cup of tea and the beauty of the space around you. Abe was our big beautiful lead gelding we said goodbye to in May of 2015. He was a horse that always stood out with his big size and beautiful majesty. As lead he held the space of presence and of the true place of leadership which comes from knowing how to hold it. Abe could walk into the space and demand respect and attention just by being. He is a big presence that is missed by us all and still deeply felt in his wisdom that he was able to powerfully hold impact for while he was with us. Nazir was our wise, old, magic man that we said goodbye to just two months after moving to our new ranch. At 30-some years of age he was one of the eldest in our herd. Nazir was a keeper of magic, we often called him a magician as he had an air about him that welcomed us into that space. A visionary and most powerful space holder, he is buried on our new land under a tree above a hill that has now come to be known as Nazir's Place. If you ask for him to give you a sign he always does and he continues to inspire us to believe in the reality of magic from his place in spirit. His presence on our land and in our herd is still deeply palpable and his "place" is one we are certain many will visit to continue to receive his wisdom. Honey was an SPCA rescue we welcomed into our herd in March of 2015. Out of all of the horses, Honey was a horse that had seen and been exposed to the most unfavorable experiences with people. And despite that, she continued to open herself up to being in the space with us. Our most eldest herd member, she held the presence of unconditional love and acceptance. She had a calm and steady demeanor that was both gentle and fierce. She was remarkable in her ability to continue to be so giving to a relationship that had not always been to her. She is a beautiful reminder of the power of love and bringing more of its beauty into the relationships we hold.